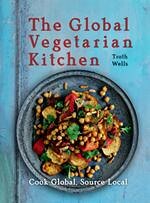 The Global Vegetarian Kitchen features more than 100 easy, appetizing recipes and outstanding full-colour images. Whether you grow your own food, source fair trade or buy local, this cookbook starts where you are, offering tips to source local and cook global. Share your own experiences with this recipe below in the comments section! You can vary the proportions to suit your taste, and according to what you have around. This is a pleasant mix of root vegetables and green herbs. It makes a warm, mild-tasting accompaniment to other dishes, or stands as a dish on its own served with rice or bread and a salad. 1 Boil the turnip and the carrots with the onion in enough liquid to cover, until they are soft. Drain, and keep the liquid. Boil the potatoes in the liquid until soft, and then drain and set aside, keeping a little of the cooking liquid. 2 Place the turnip, carrots and onion in a blender (or mash with a potato masher), adding some of the cooking liquid as required. Flavor with the turmeric, and salt and pepper. 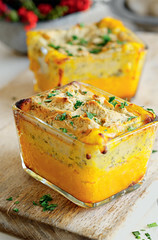 Turn out onto a shallow oven-proof dish. 3 Now mash the potatoes with the garlic, coriander, chives and half the parsley, adding a little of the retained cooking water as required. 4 Spoon the potato on top of the turnip mixture, and smooth the top with a fork. Drizzle a little cooking oil on top to help it brown. Bake for 15 minutes or so and scatter on the remaining parsley before serving.